North Atlantic Books, 9781583949511, 248pp. 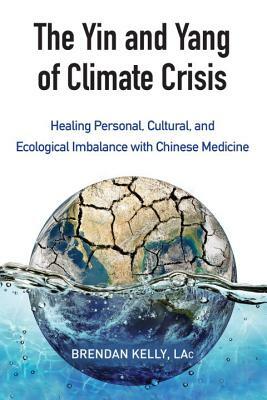 The first book to marry western environmentalism with Chinese medicine, The Yin and Yang of Climate Crisis illustrates the many ways that our personal well-being and climate health are vitally connected. Brendan Kelly demonstrates that crises such as melting ice caps, dying forests, and devastating floods are symptoms of deeper issues, both within us as individuals and within our culture. Informed by Kelly's experience as a practitioner of traditional Chinese medicine, this passionate discussion reveals that the current life-threatening severity of climate change speaks to the level of imbalance that exists in the people and institutions responsible for the crisis. Considering issues such as loss of life from increasingly severe storms, stress on farmers from rapidly changing weather, and increasing rates of disease, this book goes on to present hopeful, deep-reaching personal and societal remedies to treat the underlying causes of climate change and to restore our own health. The Yin and Yang of Climate Crisis blends the external focus of environmentalism--western science, policy issues, regulations--with the internal focus of Chinese medicine--personal health, balancing Qi, diet--to present a holistic view of our interrelationship with the planet. Kelly provides a deeper look at how we've gotten to this place of climate destabilization and ways to treat both the symptoms and their root causes. Looking through the lens of Chinese medicine, we are better able to understand that the severity of climate destabilization speaks to deeper philosophical and spiritual issues and provides an opportunity to address our own personal and collective imbalances. With his unique perspective and far-reaching perceptions, Kelly encourages us to translate the reality of our warming planet into an opportunity to ask bigger and deeper questions, including who we are, what we're here to do, and what promotes health and healing. BRENDAN KELLY has been actively involved with local, regional, and national environmental issues for twenty-five years. The co-founder and co-owner of Jade Mountain Wellness, where he currently practices acupuncture and herbalism, he also teaches at Johnson State College and the Academy for Five Element Acupuncture. Kelly lectures natinoally on a wide variety of topics, including Chinese medicine, Western herbal medicine, personal health, climate change, and other environmental issues. A long-time practitioner of tai chi ch'uan, he was authorized to teach by internationally recognized teacher and author Wolfe Lowenthal. Please visit http://personalasecological.com for more information and upcoming events.